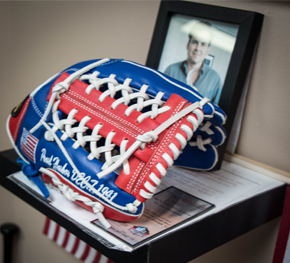 It may be the last full month of winter, but business is heating up at Vinci Pro, a baseball and softball glove manufacturing business located in Henrico County, Virginia. With spring training right around the corner, the company is busy filling orders from amateur and college-level teams and the big leagues. 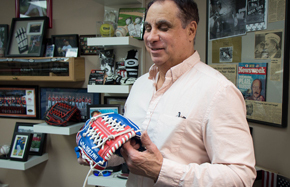 Pete Vinci opened Vinci Pro with his wife, Joanne, and son Peter in 2005 – about eight years after developing his first glove prototype. The glove maker has introduced more than 40 different models for baseball and softball, with several models making their way onto the hands of the pros. To date, Vinci is the glove of choice for 90 professional players – many of whom played on Richmond’s minor league teams, the Double-A Richmond Flying Squirrels and Triple-A Richmond Braves before them. Vinci Pro currently has about 200 authorized retailers in 43 states – as well as Canada, Puerto Rico, and the Dominican Republic. After volunteering for the U.S. Marine Corps, Pete (“Double Deuce,” as his former baseball teammates called him for his jersey number, 22) was moving towards professional baseball, but declined an invitation to train with the Kansas City Royals. Instead, he stayed home and cared for his father, a veteran wounded during the attack on Pearl Harbor who was battling Lou Gehrig’s disease. Pete promised his father he would get his name – Benjamin Vinci – into the big leagues one day. To make good on his promise, he added a personal design element to each glove his company produces: an etching of his father’s signature. Many of Vinci Pro’s customers have embraced the history and meaning behind the gloves they use. “Some of our pros started a tradition of kissing the signature for good luck,” says Vinci. They work together at the Vinci Pro office, located at Broad Street and Enterprise Parkway in Henrico. It’s decorated with sports memorabilia – including a wall that pays tribute to Benjamin Vinci, showcasing a commemorative glove crafted in his honor that was on display at the Pearl Harbor museum in Hawaii for a time. The Vinci family not only works in Henrico – they also live here. Originally from Westchester County, New York, they moved to the area in the late 1990s, attracted by its relative proximity to New York, favorable climate, and modest cost of living. They were steered toward Henrico County by their realtor, for its central location and diverse population. Since coming to Henrico, they’ve never looked back – except to honor the man whose name is on their gloves.